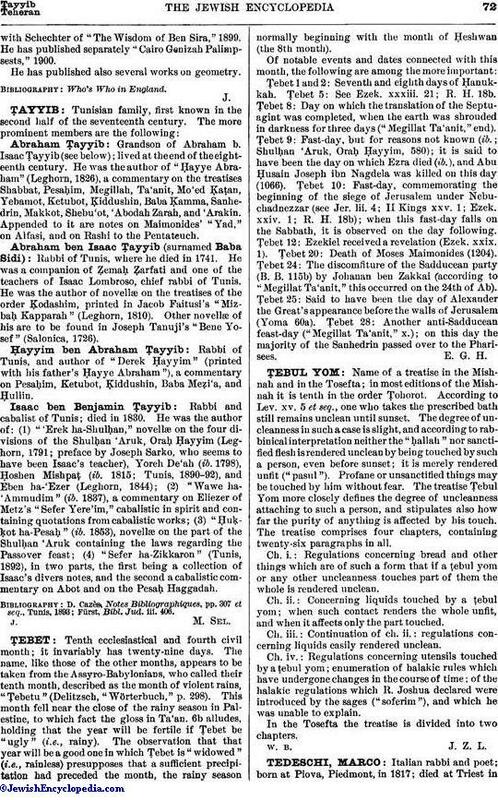 Name of a treatise in the Mishnah and in the Tosefta; in most editions of the Mishnah it is tenth in the order Ṭohorot. According to Lev. xv. 5 et seq., one who takes the prescribed bath still remains unclean until sunset. The degree of uncleanness in such a case is slight, and according to rabbinical interpretation neither the "ḥallah" nor sanctified flesh is rendered unclean by being touched by such a person, even before sunset; it is merely rendered unfit ("pasul"). Profane or unsanctified things may be touched by him without fear. The treatise Ṭebul Yom more closely defines the degree of uncleanness attaching to such a person, and stipulates also how far the purity of anything is affected by his touch. The treatise comprises four chapters, containing twenty-six paragraphs in all. Ch. i.: Regulations concerning bread and other things which are of such a form that if a ṭebul yom or any other uncleanness touches part of them the whole is rendered unclean. Ch. ii. : Concerning liquids touched by a ṭebul yom; when such contact renders the whole unfit, and when it affects only the part touched. Ch. iii. : Continuation of ch. ii. : regulations concerning liquids easily rendered unclean. Ch. iv. : Regulations concerning utensils touched by a ṭebul yom; enumeration of halakic rules which have undergone changes in the course of time; of the halakic regulations which R. Joshua declared were introduced by the sages ("soferim"), and which he was unable to explain. In the Tosefta the treatise is divided into two chapters.